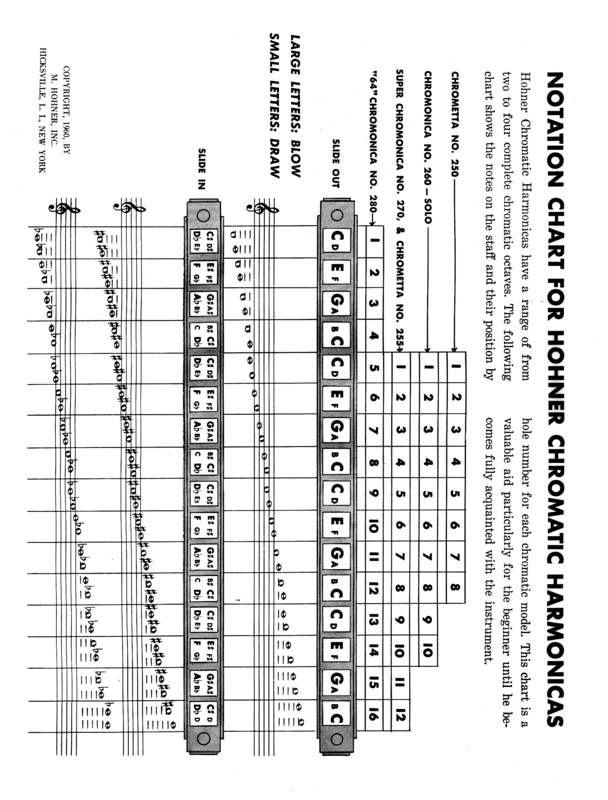 "Here is a chart showing the layout of the chromatic harmonica. Some observations worth pointing out here. Notice each four hole block is laid out exactly the same - the complete C major scale. This layout causes two C blow notes to be adjacent. Pushing the slide in always raises the note a half step. Since there are two notes in the major scale a half note apart, with the slide button in there is an extra C draw note and F blow note. Playing the chromatic in the key of D or Eb are very common in blues, a third position application. Playing in the key of C first position also has some unique advantages that use the slide. Pushing the slide button in yields four solid blues notes, 1 b3 b5 and b7, the bluesiest of the blues scale. Listen to George Smith's Boogie'n with George for a great example. And, try playing Big Walter Horton's Skip It. A great tune to experiment with getting around your C chromatic. No slide button use required and a lively number to boot! Walter actually used a Marine Band 364 Solo Tuned harp which is the same note layout as the chromatic but no slide. There was also a brief talk about ear training. Ear Training One Note Complete Method by Bruce Arnold was recommended, which includes a cd. The main idea behind his method is to practice listening to one note against a key center and quickly identifying it even if you have to guess. You must give your best answer as quickly as possible. Over time you will improve your ability to hear the entire chromatic palette of sounds, similar to your ability to recognize colors instantly. A very valuable skill!"